The capital city of Jharkhand, Ranchi is one of the fastest-developing centres in the country. Over a period of time, it has emerged as an advanced and smart city of India. Today, it is also popular amongst tourists on account of its historical monuments and natural surroundings. As the region in and around Ranchi is home to several beautiful waterfalls, it is also sometimes referred to as the land of waterfalls. Therefore, it wouldn't be wrong to say that Ranchi makes for a perfect holiday destination. But, if you are looking forward to exploring beyond the boundaries of Ranchi and witnessing what India has in store for its tourists, then this article is assuredly for you. Here, we discuss the 7 major weekend getaways from Ranchi that are all set to charm and compel you to pack your bags. The list includes pilgrimage sites, natural places and historical towns. Let's move ahead and learn in detail about them. 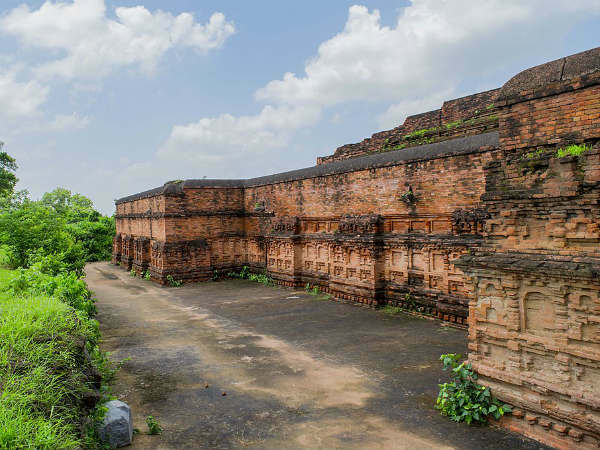 If you are a history lover or an architecture enthusiast, you cannot afford to miss visiting the age-old yet beautiful Nalanda. It is one of the oldest-known universities in the world and was established thousands of years ago during the Magadha Kingdom. Today, the university can only be found in ruins. However, it is still a major attraction for thousands of tourists in Bihar. Being a UNESCO World Heritage Site, it is frequented by tourists from all over the world. This is one place where you can turn back the pages of Bihar history and learn in detail about its legends of survival and existence. Deoghar is a destination for those who would love to spend a relaxing weekend with their family in the midst of a serene and divine atmosphere. Famous for Baba Baidyanath Temple, one of the twelve Jyotirlingas in India, Deoghar is a site of great religious as well as historical importance. As per ancient beliefs, Baba Baidyanath Temple is said to be the site where the demon king Ravana worshipped and offered his ten heads to Lord Shiva. Hence, it is considered as one of the highly revered pilgrimage sites amongst Hindus. Other places of interest here include Satsanga Ashram and Trikut Pahar. If there is any place in Bihar which must not be missed by any traveller, then it is certainly Gaya. It is one place which has been mentioned several times in the epics Ramayana and Mahabharata. As per Hindu mythology, Gaya is said to be the place where Lord Rama did pind-daan for his father, Dasharath. Another major reason which makes Gaya an important weekend destination lies in its significance amongst Buddhist. Gaya is also said to be the place where Lord Buddha gained enlightenment and preached sermons to his followers. Therefore, it is one of the most prominent religious sites in the world amongst Buddhists. Kendujhar is a land of temples, forests and waterfalls. Therefore, it makes for an ideal weekend getaway from Ranchi. Wouldn't you to take a refreshing bath in waterfalls and savour the divinity of temples? If yes, then Kendujhar should be on your bucket list of weekend stoppages. The major places which must be explored here include Murga Mahadev Waterfall, Badaghaghara Waterfall and Kushaleshwar Temple. Another site which is known for its religious significance, Giridih is located in Jharkhand and is immensely popular amongst tourists for Shikharji, which is a Jain pilgrimage centre and is located atop Parasnath Hill. Did you know that Parasnath Hill is the highest mountain in Jharkhand? Yes, apart from savouring the peaceful atmosphere of Jain temples at Shikharji, you can also capture the panoramic beauty of Jharkhand from the top of its hills. The first planned industrial city in India, Jamshedpur is a perfect weekend stoppage as it is home to gardens, hills, parks and temples. It is surrounded by beautiful Dalma Hills and is home to numerous beautiful rivers, such as the Kharkai river. The major places which can be witnessed and savoured within its boundaries include Dalma Wildlife Sanctuary, Jubilee Park, Tata Steel Zoological Park, Dimna Lake, Bhuvaneswari Temple and St. Mary's Church. Located on the banks of the North Koel river, Daltonganj is popular for its ancient Palamu Forts, which were built by a Rajput king several centuries ago. Even though the forts are in ruins and are not well-maintained structures, it is still a weekend stoppage for numerous history lovers. These age-old twin forts are located in forests on the outskirts of Daltonganj and make for a beautiful weekend getaway for every offbeat traveller.